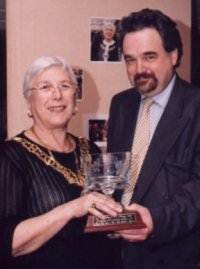 My charity is the re-furbishment of the Breast Care Cancer Clinic at the North Middlesex Hospital. 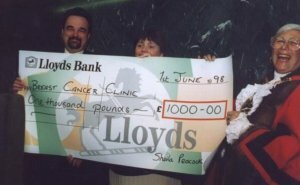 I chose this because I had breast cancer in 1996 and was treated at the North Middlesex Hospital. I received excellent treatment but the facilities desperately need improving. 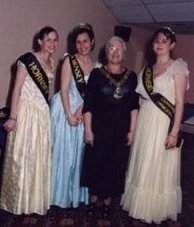 Income for the Charity comes mainly from fundraising events organised by the Mayor's office, or by individuals holding fund-raising events on behalf of the Mayor. Recent events have included a Basketball match, two quiz nights, a Sunday lunch at a Greek Taverna, Halloween night at Bruce Castle Museum, a disco for 1000 at Tottenham Green Leisure Centre, a Carol and organ concert in the great hall, Alexander Palace and Sunday Lunch at a Turkish restaurant in Green Lanes. If you have any ideas for new events please contact me. This is me, playing football. 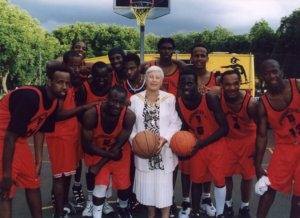 The shot was taken to publicise the Mayor's 7 a-side football tournament, which took place at New River, White Hart Lane. 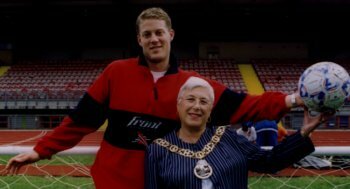 The event was extremely successful with more than twenty teams participating, Espen Baardsen, the Spurs goal keeper, gave out the medals at the end of the tournament. The winners were Selby All Stars. 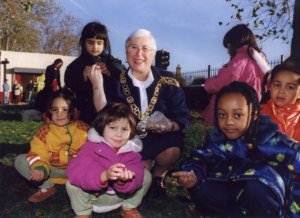 Planting bulbs in the shape of the breast cancer ribbon in Chesnut Park, with children from Woodlands Park Infant School. The winners of the basketball tournament at Ducketts Common. Here I am with the Hornsey Carnival Queen, Michelle Collins my granddaughter, and Princesses Ellie and Emma. 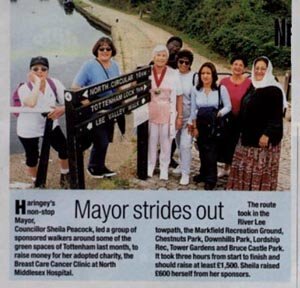 I would like to thank everyone in the borough who helped raise funds for the mayors charity. We raised over £28,000 a magnificent sum.